Round one kicked off with the grand final rematch between North Beach and Trinity Aquinas. 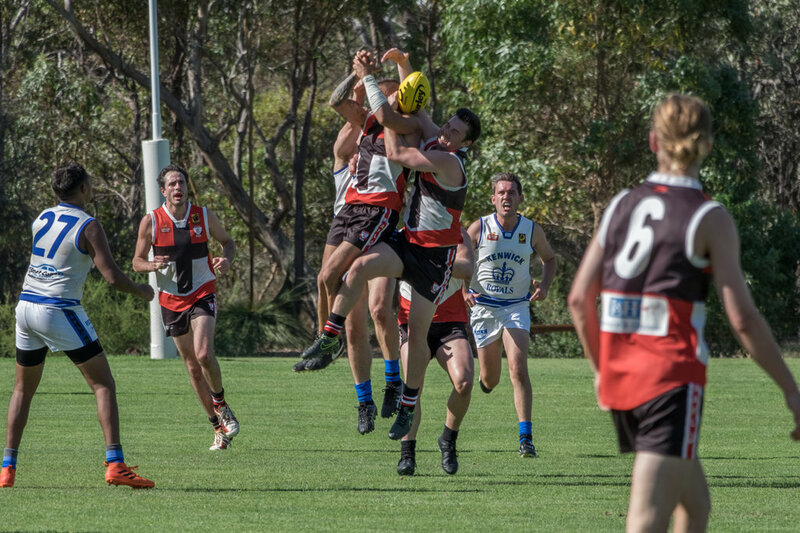 After going down by 34 points in last year’s season decider North Beach came out firing in the first half kicking five goals to nil in the first quarter. They added another six goals in the second quarter to lead by 55 points at the major break. However North Beach failed to score again until the fourth quarter with Trinity Aquinas kicking eight goals straight in the third term. 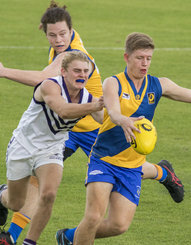 With the margin just nine points at three quarter time North Beach kicked the first goal of the final term to maintain their lead. In the end it was a tight finish with North Beach claiming victory 14.8 (92) to 13.3 (83). Wanneroo were impressive in their first A Grade match since 2006. Last year’s B Grade premiers came up against an experienced A Grade team in Curtin Uni Wesley. It was a convincing 65-point victory with Brayden Duckworth and Callum Bramley kicking three goals each. With the club never having competed in the A Grade competition, Kingsway were competitive in the clubs first A Grade match. They came up against Kalamunda at Ray Owen Reserve going down by just four points. Justin Simpson kicked five goals for Kalamunda while Jordan Bestry kicked five goals for Kingsway. After finishing in second position in 2017 Fremantle CBC started 2018 with a convincing win over Wembley by 48 points. Jacob Green kicked six goals for Fremantle CBC. Scarborough also had a convincing win over University by 49 points. The win sees them finish the round on top of the ladder with the best percentage so far. Round 1 saw every team win by 30 points or more with 67 points being the biggest margin. After being relegated at the end of 2017, Whitford went down by 37 points to Swan Athletic. It was a close match throughout before Swan Athletic added six goals to two in the final quarter. West Coast were also relegated at the end of 2017 after spending four years in the top grade. They came up against Collegians and were beaten convincingly by 42 points. Declan Mcnamara kicked five goals for the winning side. North Fremantle had the biggest win of the day with a 67-point victory over Maddington. Maddington survived relegation last season by just one win. Mt Lawley and Kingsley both had wins in Round 1, David McKinlay booted six goals up forward for Mt Lawley. Ballajura finished in second position on the ladder in 2017 however two losses in the finals sees them continue in C1 for another season. They added four points to their name in round 1 with a 48-point win over Bullcreek Leeming. After being relegated from B Grade, Stirling had a strong win over Kenwick by 61 points. Damien Lloyd kicked four goals for Stirling in the win. Willetton had a percentage boosting win of 75 points over Quinn’s Districts at Ridgewood Park. Gosnells and Bassendean added wins in Round 1 with Gosnells defeating Melville by 58 points and Bassendean defeated Carlisle by 47 points. Nollamara had a handy percentage boosting win over Swan Valley running out 112-point winners 28.9 (177) to 10.5 (65). It was a close game in the end between Canning South Perth and Canning Vale. Canning Vale were leading by eighteen points at three quarter time however a four goal to two final quarter saw the margin cut to just seven points. Warnbro Swans, Dianella Morley and Ocean Ridge also recorded wins in round 1 with Ocean Ridge winning by 50 points over SNESA. After playing the in the C4 Grand Final last year Secret Harbour and Kwinana both had good wins in round one. Secret Harbour defeated Ellenbrook by 76 points while Kwinana defeated Piara Waters by 67 points. Coolbinia dominated in their match against Mosman Park winning by 65 points. While Belmont Districts and Cottesloe had a closer match with Belmont Districts defeating Cottesloe by 12 points. 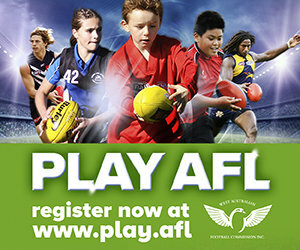 All the winners this week won by more than 40 points expect for the match between Cockburn Cobras and Bayswater. Cobras took the lead early in the match before Bayswater fought back to be within nine points at three quarter time. But it was the Cobras who kicked three goals to one in the fourth quarter to win by 24 points. Cameron Van Oss kicking six goals for the cobras. Jandakot and Osborne Park had percentage boosting wins with Jandakot defeating Manning by 64 points while Osborne Park defeated Armadale by 91 points. Cockburn Lakes and Yanchep were the other winners in round one.